Beginning and ending workouts with stretching is a great way to loosen up and wind down. The Accessible Shoulder Rotator is an efficient, low impact tool that targets the stretching and strengthening of shoulders, chest, back and abs. Featuring slip resistant hand grips on the two circular disc panels, rotate clockwise or counter clockwise, engaging the shoulders, arms and wrists. The fully enclosed magnetic rotating mechanism ensures smooth revolutions and adequate resistance. Designed for all adults, abilities, wheelchairs and other mobility devices, the ADA compliant Shoulder Rotator is strategically crafted for comfortable, convenient pull-up and user access. 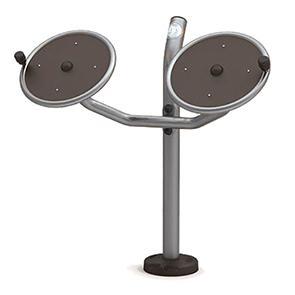 Constructed with commercial grade steel and finished in a durable powder-coat, the Shoulder Rotator Station is built to last and provides an alluring accent to outdoor parks, playgrounds or community centers.